*based on double occupancy airfare not included. Explore the history and beauty of these two extraordinary destinations including Cairo, Accra, Kumasi and the Gold Coast. Enjoy rich cultural experiences that span thousands of years of history and the continuous practice of age old traditions. Walk into the vestibules of the ancients; explore historical landmarks and experience unforgettable hospitality. US citizens must have a valid passport and a visa to travel to Ghana. In addition to a visa, travelers to Ghana should make sure their passports have 6 months of validity after the planned date of departure from Ghana and a blank visa page for the entry and exit stamp. The cost of the visa is $160. Visas: U.S. citizens must have a visa to enter Egypt. U.S. citizens can obtain a renewable single-entry 30-day tourist visa on arrival at Egyptian airports for a 25 USD fee. A multiple entry visa is also obtainable for 60 USD. Arrive in Cairo, Egypt. Meet tour assistant and transfer to the hotel. This evening, enjoy a Nile Cruise that includes an Egyptian buffet dinner and cultural performance. After the cruise we will return to the hotel. After breakfast we go on a full day tour of the Giza Pyramids, Memphis, and Saqqara where we will visit the towering pyramids, the ruins of Memphis in the village of Mit Rahina, and the Saqqara Necropolis, where the step pyramid of Zoser stands. After lunch, we return to the hotel where you will have the rest of the day to relax or pursue other activities. After breakfast we will enjoy a full day tour of Cairo including the Cairo Museum in Tahreer Square. 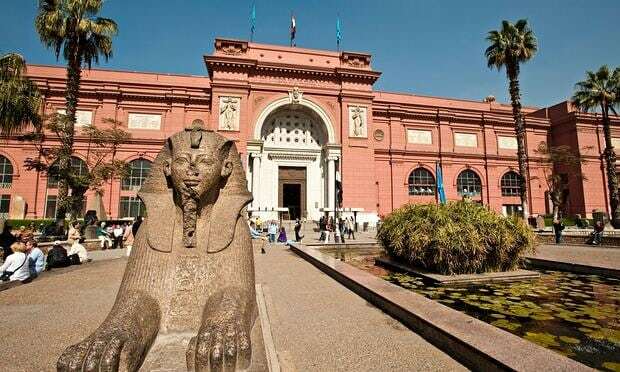 This museum houses magnificent Egyptian Antiquities from different periods throughout Egyptian history, including the magnificent treasure of King Tutankhamen, whose tomb was discovered in 1922 by Howard Carter. All of Tutankhamen’s treasures have been moved to this museum along with the famous 11kg mask of gold. After lunch, we head to the citadel of Salah al Deen and the Mohamed Ali Mosque followed by a visit to the oldest bazaar in Africa (Khan El Kalili Bazaar). This morning we depart for Accra, Ghana. After pickup from the airport, we will enjoy lunch at a local restaurant and have an orientation on Ghana's history, culture, and customs. After the orientation we begin the city tour of Accra with a visit to an adjoining garden, close to the National Museum of History and Ethnography, to observe exhibits that reflect the heritage of Ghana throughout history to the present. From there we visit Independence Square, Accra's open-air ceremonial grounds where all national celebrations are held. We continue onward to Kwame Nkrumah Mausoleum and Museum, a tribute to Ghana's first President, Dr. Kwame Nkrumah. This park, formally called the Polo grounds, is where Dr. Nkrumah declared Ghana’s independence. This evening there is a welcome dinner. Tailors and dressmakers will be in attendance to take your orders. After breakfast, we drive to Kumasi, the Capital of the Ashanti Kingdom of Gold. We will drive pass several scenic villages with fine examples of traditional Ghanaian buildings. We should arrive in Kumasi by midafternoon and thereafter proceed to a half day tour of Kumasi. There we will visit the Manhyia Palace Museum built in 1925 by the British to receive Asantehene Prempeh I the Asantehene (king) of the Kingdom of Ashanti when he returned from exile in the Seychelles to resume residence in Kumasi. We’ll drive past the Kumasi Central Market, the largest open-air market in West Africa, to visit the National Cultural Center which is home to the Primped II Jubilee Museum. This museum was named after the former Asantehene, Nana Osei Agyeman Prempreh II. Exhibits in this museum include a replica of the famed Golden Stool, which is believed to have descended from the sky and is the spiritual symbol of unity for the Ashanti people. After breakfast, we visit the Ashanti craft villages. Highlights will include: The woodcarving village of Ahwiaa, known for the talented craftsmen who fashion royal stools, walking sticks and fertility dolls from wood. You will have the opportunity to purchase hand carved items of all kinds. Our next stop is the village of Ntonso where artisan's hand-stamp patterns on cotton cloth to make Adinkra textiles. Black-on-black and black-on-red Adinkra cloth is worn for funerals and other solemn occasions. You will learn how the black dye is made in the village from the bark of trees, and will create your own Adinkra sash to take home. You may also purchase large pieces of Adinkra cloth handmade in the village. Our final village is Bonwire, where the famous Kente cloth is handmade on looms in a time-honored tradition passed down through generations. You will see the Kente weavers in process of creating Kente cloth in various styles, and have the opportunity to purchase souvenirs or gifts. This evening we visit the Kumasi Central Market (also known as Kejetia Market), the largest open-air market in West Africa, where more than 10,000 vendors sell their wares. After breakfast we set off Southwards to Elmina in the central region of Ghana. The town of Elmina was given its name by the Portuguese due to the abundance of gold found in Ghana, translated Elmina means The Mine. Gold is of such importance to Ghana today and historically that the region was even known as the Gold Coast before independence. Ghana's gold is of the highest quality and we are the 8th largest exporter in the world and second largest exporter in Africa behind South Africa. We stop at Assin Manso, an important town along the enslaved African trade routes. The town surrounds the NdonkorNsuo (Enslaved African River). This river is where enslaved Africans were checked for fitness and bathed before being transported to Cape Coast for shipment to the Americas. The slaves would have walked hundreds of kilometers from Northern Ghana through thick forests in shackles and chains, many being in poor health once they reached Assin Manso. Once bathed and rested the slaves would continue the final 32-mile march to the dungeons of Cape Coast Castle where they would remain for up to 6 weeks before being shipped to the Americas. In 1998, a symbolic gesture was made when the bodies of two free (previously enslaved) Africans, Samuel Carson from New York U.S.A and Crystal from Kingston Jamaica were returned to Cape Coast Castle and symbolically passed through the "Door of no Return" before being transported to Assin Manso for re-internment. After our tour, we continue to Cape Coast, where we have lunch upon arrival at a local restaurant overlooking the ocean before visiting the nearby Cape Coast castle which has been designated as a world heritage site by UNESCO. The castle is a thought provoking monument to a harrowing period in the region's history. Quality time will be spent in the afternoon on an emotional journey touring this castle which held more enslaved Africans captive than any other in West Africa. Here is where we view the dungeons and the infamous "Door of no Return". There is a historical museum inside, which explains the entire history of the castle and Cape Coast itself. There is also a souvenir shop selling literature on all of Ghana's forts and castles, as well as the cultural history and traditions of Ghana. After a wonderful but thought-provoking day, we check into our accommodations, have dinner, and relax. Today, we have an early start as we set off for Kakum National Park and Africa's world-famous rainforest canopy walkway. This is a truly beautiful tropical guinea rainforest and the canopy walkway is sure to be a highlight of your time in Cape Coast. This national park protects the original habitat that was found in this location and was the home of locals and a major source of food. The walkway consists of 7 bridges, attached to 7 emerging trees, 40 metres above the rainforest floor. Prepare to take a deep breath as you walk the suspended bridges. You will marvel at the outstanding views that stretch for miles across this breathtaking rainforest as you rest on the viewing platforms that are attached to the emerging trees between the bridges. We are sure you would agree that this is an exciting excursion never to be forgotten. We return to the park headquarters where we find an excellent information center that offers a very informative overview of the park’s flora and fauna. Over 40 different mammal species have been recorded within the park, which includes forest elephants, leopards, and six (6) primate species to mention just a few. A short distance from Kakum and on the border of the forest we find the International Stingless Bee Project. There have been approximately nine (9) species of stingless bees identified here in Ghana and their importance to it’s ecosystem is paramount. Our tour of the center teaches us about the importance of bees to the local ecosystem and the medicinal qualities of their honey. We stop for lunch at Han's Cottage Botel near Kakum. Han's is built over a lake containing Nile crocodiles and is set in a beautiful location surrounded by tropical guinea rainforest. It is an original and comfortable establishment, which is teeming with bird life and an excellent place to enjoy lunch before setting off for Elmina. During our time in Elmina we will visit the castle of St. George. This is the oldest extant colonial building in sub Saharan Africa dating from 1482. This castle is steeped in history and played a prominent part during the tragic transatlantic enslaved African trade era. There is an informative museum inside which concentrates on local history and it is designated a world heritage site by UNESCO. Lastly we will see the fishing market of Elmina and enjoy the sights of the many colorful fishing boats bringing their daily catch into the harbor. Be sure to take the opportunity to mix with the locals at the nearby market. A short distance from the market we visit the boat builders who still build colorful fishing boats using traditional tools and methods spanning centuries. Our final evening in the central region of Ghana.Spend the day at our accommodation or you can venture into town to experience nightlife with the locals. Today we have a relaxed morning to enjoy the facilities, maybe go for a swim or relax on the beach or just enjoy our final morning at this beautiful location. Prior to lunch we will freshen up and re-pack our bags. Our local guide will collect them from your room and load them on the transport vehicle. Before returning to Accra, we will enjoy our lunch overlooking the beautiful Gold Coast of West Africa. En-route we will stop at "Kotokoraba" the cradle of Cape Coast. The Kotokoraba "market" is the economic hub of the region, with vibrant trading stores located around it. The market has existed for many decades, and was an important trading site during the pre-independence era. It serves as a central point for all trade in the region and is the hotspot for economic activity as most major activities in the city takes place in and around the area. Afterwards we continue onward to Accra, where we will have an opportunity to do some last minute shopping and where we will enjoy our evening meal before transfer to the airport to catch our flight back home. All airfare and land package rates quotes from Washington Dulles (IAD) (airfare from other cities can be arranged). Deposit: $300 due by 9/15/18 to confirm hotel and tours. Deposits accepted until sold out. Balance due: 3/15/19. Deposits are non-refundable and non-transferable. Deposits can be made in any amounts as long as balance is paid on time. Suggested payment schedule: $500 per month. Insurance quote will be provided once registration form is received. Make checks payable to Colesville Travel. MasterCard, Visa accepted. Returned checks will be charged a $30 fee. Not included: tips for drivers and tour guides, items of a personal nature. Passport, yellow fever immunization and visa required. Passport must be valid for 6 months past departure date. Questions or ready to book this experience? Submit a booking request for a detailed quote and more information about this expereience.